Basseterre, St. Kitts, January 9, 2016 (RSCNPF): One person has been charged in the early morning robbery of the Ma Pau Casino in Basseterre. The robbery occurred early Monday morning (January 4). 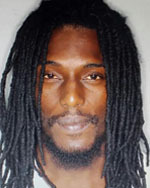 Arrested and charged is Eric Thompson of Ponds Pasture, Basseterre. Thompson is charged on four (4) Warrants in the First Instance for Armed Robbery. Charges were laid on Friday, (January 8). Thompson has been remanded at Her Majesty’s Prison. Investigations have revealed that the property was robbed shortly after 7.00 am that morning and a large sum of cash was taken. “Calling the Police or Crime Stoppers with information regarding a crime or criminal activity, makes a difference, it did in this case, I encourage the public to partner with us and report what you may see or hear with regards to criminal activity. Let us ensure an environment of citizen safety together,” said ACP Queeley.